The steel pan evolved out of earlier musical practices of Trinidad’s African descendants. 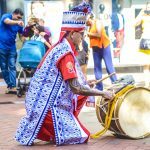 Drumming was used as a form of communication among the enslaved Africans and was subsequently outlawed by the British colonial government in 1883. A comprehensive film about the origins of the steel band and how pans are made. 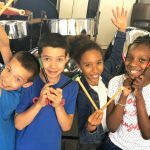 While many instruments have experienced some degree of evolution in recent years, the steel pan has the distinction of being the only instrument to be truly ‘invented’ in the 20th century. Calypsonian Roaring Lion tells how steel band started in Trinidad. The first instruments developed in the evolution of steel pan were Tamboo Bamboo, tunable sticks made of bamboo wood. These were hit onto the ground with other sticks in order to produce sound. Tamboo Bamboo bands also included percussion using biscuit tins, oil drums, and bottle-and-spoon. Historian Oscar Pile tells how steel band started in Trinidad in the 1930’s and ’40’s. By the mid-1930s metal percussion was being used in the Tamboo Bamboo bands, the first probably being either the automobile brake hub ‘iron’ or the biscuit drum ‘boom’. The former replaced the bottle-and-spoon, and then later the ‘bass’ bamboo that was pounded on the ground. By the late 1930s the occasional all-steel bands were seen at Carnival and by 1940 it had become the preferred Carnival accompaniment of young underprivileged men. The 55-gallon oil drum was used to make lead steel pans from around 1947. The Trinidad All Steel Percussion Orchestra (TASPO), formed to attend the Festival of Britain in June 1951, was the first steel band whose instruments were all recycled from oil drums, and the first time steel pan music was heard in Britain. The festival, held to mark the centenary of the Great Exhibition of 1851, took place at the newly built South Bank Centre in London. Sterling Betancourt tells of TASPO’s historic visit to The 1951 Festival of Britain. The members of TASPO consisted of the twelve best pan musicians in Trinidad at the time including Ellie Mannette, Sterling Betancourt, Philmore ‘Boots’ Davidson, Belgrave Bonaparte, Andrew ‘Pan’ De Labastide, Theo Stephens, Anthony Williams, Dudley Smith, Ormand ‘Patsy’ Haynes, Winston ‘Spree’ Simon and Granville Sealey. The musical director and conductor was Lieutenant Joseph Griffith from Barbados, a member of the Trinidad Police Band and director of music for the government of St Lucia. In the years to follow most became pioneers for the steel pan instrument and it’s music. in 1992 the steel pan became the national instrument of Trinidad and Tobago acknowledging the progress made at home and abroad. 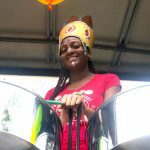 The steel band is now much more than just entertainment for a Caribbean themed party. It is an orchestra of hundreds playing any style of music from traditional classical to dynamic and original compositions, it is also an experimental ensemble working with other instruments to create new work. An award winning documentary film Classical Steel, features the steel orchestra in the role of symphony orchestra. Trailer of Classical Steel documentary.